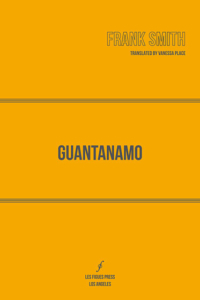 Frank Smith’s Guantanamo, originally published in French in 2010 and recently translated into English by the conceptual writer Vanessa Place, focuses on a moment in the prison’s history when the fight over language and classification was particularly loaded. The 2004 Supreme Court decisions in Hamdi v. Rumsfeld and Rasul v. Bush ruled that all Gitmo detainees were guaranteed the right of habeas corpus, a move that eventually led to the formation of Combatant Status Review Tribunals (CSRTs). At stake in these military-led, closed-door hearings was a question of naming, specifically whether or not a prisoner was an “enemy combatant.” It’s a status that carried profound consequences — either hope of release (which eventually happened with both Hamdi and Rasul) or a position beyond the reach of the U.S. courts as an indefinitely detainable body. The interrogator says the interrogated received two weeks of training on the Kalashnikov rifle. The interrogated says the part about the two weeks is right. What exactly is being admitted to here, we wonder. That two weeks, at some point in the past, transpired? What “part” is the prisoner referring to? Rather than offer answers, the transcripts quickly move on to a separate set of questions about Tora Bora. It is said that at the time he was captured, the interrogated had a Casio watch, model F-91W, used by Al Qaeda to make explosives. The interrogated says that this evidence is surprising. That millions of people around the world wear this kind of Casio watch. That if it is a crime to own one, why not condemn the stores that sell them and the people who buy them? That a watch, that’s not a logical or likely piece of evidence. Detainee [addressing the President of the Tribunal]: She’s the judge, her? You’re the judge, you? President of the Tribunal: No, I’m Officer of the Military Tribunal. This is not a court. Our search for even the semblance of linguistic certainty or stable meaning is further frustrated by the fact that Guantanamo comes to English readers as a multi-layered translation: the original questions posed by Americans were answered in languages like Pashtu, Uzbek, and Arabic, that were then translated into English. Smith translated that English to French before Place translated it back. We can only wonder at the losses and approximations involved in each step. Place’s parallel translation, where the French transcripts regularly extend beyond their English counterparts, shows how different even the two closely related tongues are, a stark visual reminder of language’s slipperiness, of our lack of an original Logos on which all other words depend. We say that according to the Reference Guide to Terrorist Organizations of the United States Department of Homeland Security, HIG [Hezb-e-Islami Gulbuddin] has long-standing ties with Osama bin Laden.